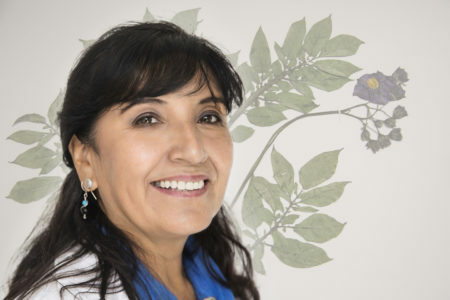 When Fanny Vargas looks at an herbarium specimen, she sees more than a plant captured in time, she sees its entire story clinging to it like fine pollen. She can imagine the gasp inducing altitudes where they were collected, the rocky crevices the stubborn plants grew in, the arduous often death-defying trips collectors would take to preserve for prosperity the knowledge embedded in the plant’s morphology and DNA. For the past 34 years, as a member and supervisor of the International Potato Center’s herbarium team, Fanny has fanned out leaves and petals on to acid free sheets. Her hands working with surgical precision to meticulously adhere stems and flowers with glue and thin strips of paper. Equal parts artist and scientist she creates compositions that are both faithful to science and the spirit of the flower she’s cataloguing. Fanny was still a student when she first joined the CIP herbarium team during her last semester at the Agrarian University located across the street from the CIP campus. It was 1984 and Carlos Ochoa was at the helm. Fastidious and demanding, Fanny dedicated herself to aiding Ochoa in his unrelenting quest to find, identify, preserve, and disseminate information about the world’s potato species. Work started promptly at 6:30 a.m. and ran through Saturdays. 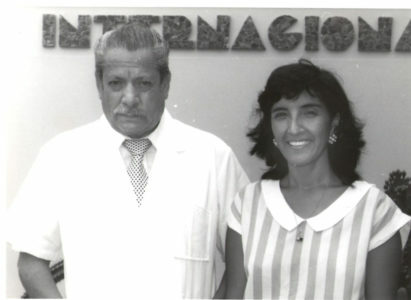 Other interns came and went, but Fanny completed her apprenticeship and went on to assist Ochoa until his retirement and his protégé, Alberto Salas took the helm. “The work was interminable and often tedious,” says Fanny. But over time she realized its importance. Ochoa was dedicated to mitigating hunger and poverty through potato cultivation. Crucial to that was cataloging and understanding potato in its natural habitat and the depth of the genetic diversity available for plant breeding. “We’d pull hundreds of specimens a day from the herbarium shelves,” says Fanny. “Ochoa would examine each sheet placing a loupe millimeters from his eye.” As he scrutinized each detail he’d think aloud working to decipher the variety and often offering tidbits about where it was collected, “this one I found in a cave,” he’d mutter. As Fanny assisted Ochoa while he worked on his definitive tome, the Potatoes of South America, she learned to see the stories behind each plant, and the importance of her work. Over time, slips of typewritten paper have been replaced with bar code stickers, but the information remains the same, the where, when and who collected a species, along with its GPS coordinates and altitude. In it’s quickly approaching half-century of existence, CIP has amassed more than 21,816 accessions for a total than more than 70,100 sheets and is widely regarded as one of the most comprehensive potato, sweetpotato, and Andean Root and Tuber herbariums found in the world. 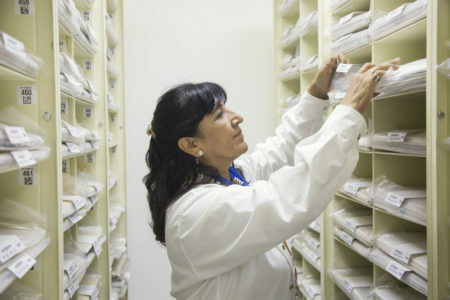 Each plant collected is regenerated by the genebank in order to increase the genetic material available of a given population. 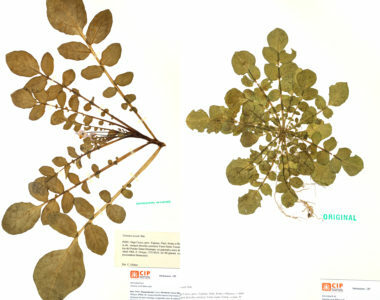 Visual records kept of subsequent generations and new collection trips show how a plant’s environment impacts its growth. Amongst the thousands of samples Fanny has catalogued are two Solanum acaule samples which despite being the same inventory look quite different from one another. The original sample was collected at 4,000 meters where temperatures drop below freezing, has small huddled together leaves that grew close to the ground. “It’s almost like their trying to cuddle up to the soil for warmth,” says Fanny. With the world population fast approaching 8 billion and urbanization overtaking the countryside, the ways in which herbariums help deepen our understanding of plant behavior will become even more vital. Some of the world’s top taxonomists, John Wood, and DF Austin, have visited the CIP herbarium. Pouring over records they’ve reclassified specimens and verified others. Unlike a photograph that is limited to what was captured at any given time, “an herbarium provides precision down to the millimeter,” says Fanny. The fine hairs on a plant can be measured and counted. Subtle variations can make a huge difference. With each new accession catalogued, Fanny feels like a bridge between the past, present, and future. She’s memorized the space of her canvas, knows instinctually when she needs to turn a leaf so that it harmonizes on the page and doesn’t spill across the edge. For her, preparing a specimen is like sending a message across time. She knows that it will carry the stories of the plant, the environment, the people behind it, Ochoa, Salas, CIP, herself, to future generations. “It’s like leaving a note that people will read a 100 years from now,” she says. “Collecting these specimens is the most beautiful thing. Out all the flowers you are giving them a beautiful ending of helping improve the earth.” But in a herbarium a plants ending is just the beginning of its story. “These plants will remain immortal,” Fanny says with a smile.